Calmness filled my body. Just like he said it would. It had taken some time to make the traditional Bedouin tea. First there was the four hour drive from Amman. After 3 hours on the hot dusty road back and forth to the refugee camp in Azraq, plus a day of soaking up new experiences, on top of a midnight arrival from London the night before, I had dozed a little in the drive after the sun had set and we had eaten our Ramadan breakfast. 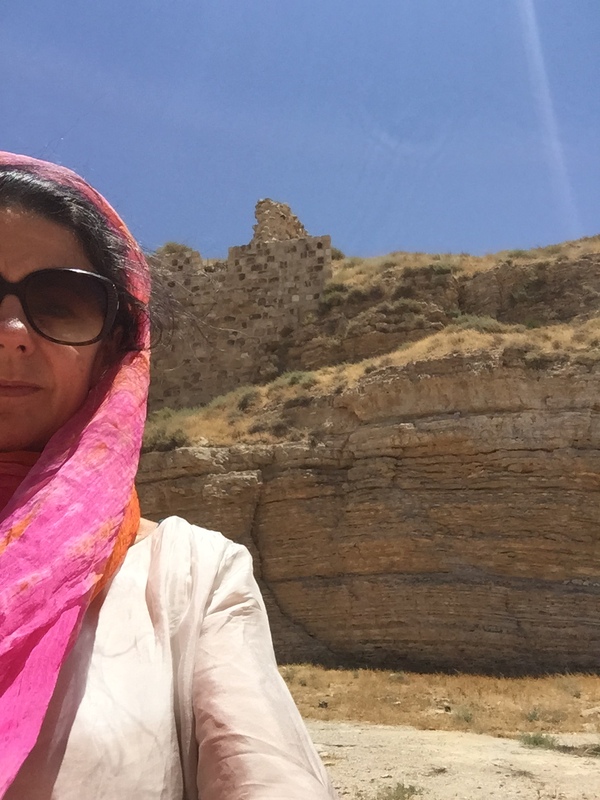 I had no idea where I was – somewhere in Jordan clearly since apart from a routine police checkpoint we hadn’t been stopped. So here I was in a place I hadn’t heard of and hadn’t planned on visiting. When my Bedouin chief guide Audh had suggested it I couldn’t think of any good reason why not though, and I like a bit of spontaneity, so here I was. That got my attention. Good job I hadn’t wandered around in the dark for long. In the cooking area, a tiny ginger cat lay curled in the suspended vegetable basket, barely reacting to the sudden presence of a couple of humans in her space. I found out afterwards that she liked to sleep there because then the mice couldn’t get her. She was apparently still learning how to be a cat. The silence out there in the Dana reserve, perched on a cliff above the geological structures that further north contained the Dead Sea, was palpable. As I looked about for matches, my every movement sounded like a deafening crash. The match quest was unsuccessful and as the Bedouin chief went off to his pickup truck for a long search, leaving me to settle into the hush until he eventually returned with an almost functioning cigarette lighter. Ten minutes later we were at last drinking tea. Painfully sweet on the first sip but, as promised, the sugariness abated as the herbs brewed. He had added a bunch of something unrecognisable plucked from the side of the path, with the promise that after the third cup I would feel drunk. Hmm. Not quite my aim, miles from another human being, alone with a virtual stranger. ‘Not drunk, I mean relaxed,’ he amended his prediction seeing my concern. I trust peoples a default, but pay attention to my gut feeling. I didn’t feel in any danger or I wouldn’t have been there. I had already explained to him in the car that some of my friends had warned me off giving him a call on my return to Jordan. It was now up to him to confirm my view that he was honourable. “Queen Catarina I will make you proud of me’ he declared solemnly. So now, on my third glass of tea, I did indeed feel intensely relaxed. My edges had merged with the deep silence of the night sky. I was enjoying the lack of conversation. The sense of being in the right place in the universe in this moment. Three other guys had by now appeared, drawn magically from who knows where by the smell of tea and all of us sit in companionable silence. No chatter. No nervous small talk. We were all at peace with ourselves and our thoughts. Bright sunlight woke me at 6 and I rushed out to see the promised sunrise. 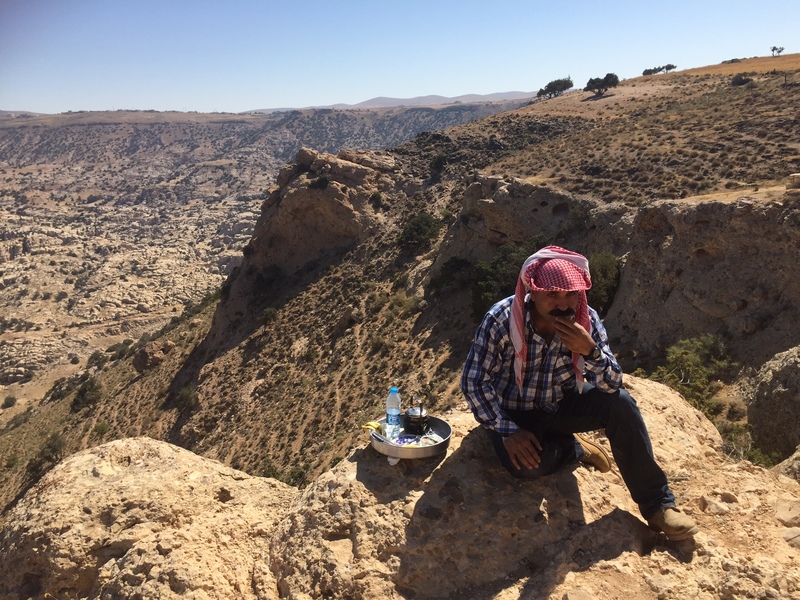 The scale, colours and sense of ancient existence of the Jordanian landscape is stunning. That feeling stayed with me all day. 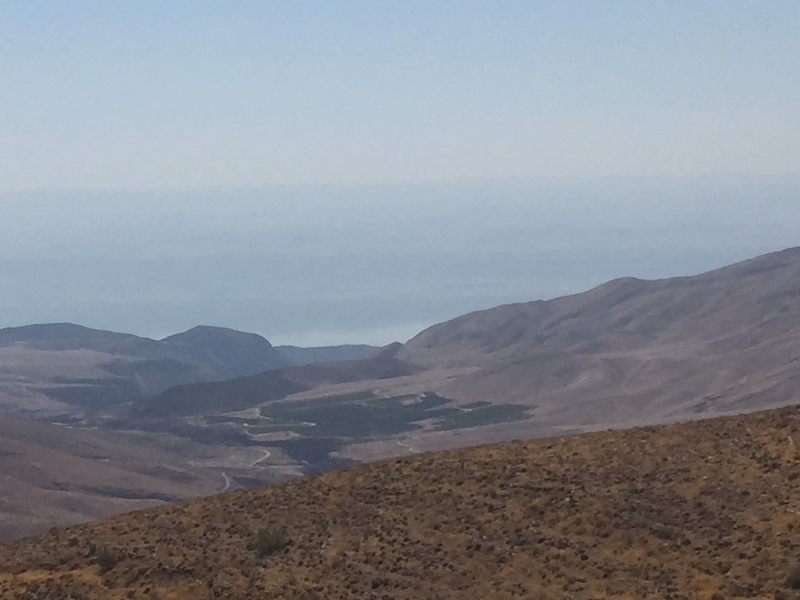 The huge emptiness of the valley between Jordan and Israel where the Red Sea lingers contrasting with endless human interactions despite – maybe because of – the scarcity of people. It seems that nobody is a stranger in Jordan. I saw breath-taking scenery that day, natural and human made wonders. I felt privileged to be almost the only person at most of the places in which I spent time. Picnicking on local freshly made flatbread and a tomato we had hewn open with a sharp rock, on the top of the mountain where John the Baptist was beheaded, looking out over Jericho and Jerusalem across the valley, with not another soul in sight. It’s a wonder Jordan isn’t mobbed with tourists, people don’t know what they’re missing. We picked up an old man who was walking to visit his son in the next town. Half way to take him there (which wasn’t the direction we were originally heading) we passed a bus, stopped it and involved the bus driver in the safe delivery of the accidental passenger. Each step in this process required extended and enthusiastic conversation. Not understanding a word of what they were saying, I would have guessed they were first cousins or at least had known each other since childhood but no, it turns out they were strangers to one another. So very different from the way big cities operate. We stopped to buy bread but the bakery Audh had expected to visit was closed. A shopkeeper from across the road noticed and came out to try and help. He recommended an alternative bakery, then jumped in the car to go with us to make sure we could find it. When we explained that because of our schedule we really couldn’t go back with him to his home for dinner he insisted we wait while he went back to the shop to buy us a soft drink to see us on our way. I think the different perspective on time helps with this generosity of all resources, probably intensified by the adversity of the landscape. Nobody could survive without cooperating. But also it seems to generate a great deal of satisfaction for all involved. Both the helper and the helped walked away beaming each time. Even if one person has benefited more than the other in a particular interaction both parties seem confident that balance will be restored in other ways on other occasions.